Is BlackBerry's new Priv the last phone it makes? BlackBerry's new phone, the Priv, came out on Friday. But will it be the last new phone the company ever makes? BlackBerry (BBRY) has struggled mightily in the past few years. It lost subscribers, sales and a boatload of money because it didn't fully commit itself to the touchscreen, app-centric world we're all accustomed to. BlackBerry now lags Apple (AAPL) and the army of companies that make phones which run on Google's (GOOGL) Android mobile operating system in global smartphone market share. Microsoft (MSFT) -- thanks to its Windows Phone OS -- is ahead of BlackBerry too. The stock is down more than 25% so far in 2015 and nearly 90% in the past five years! So the pressure is on BlackBerry to launch a phone that consumers might actually want. 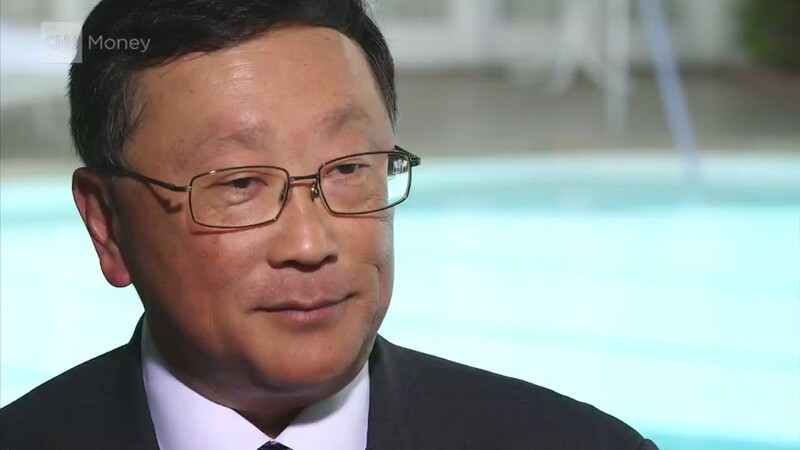 CEO John Chen hinted in several interviews last month that BlackBerry may stop making phones if it can't sell 5 million of them a year. That's the level he thinks is necessary for the hardware business to be profitable. So BlackBerry has done something that would have been unthinkable just a few years ago -- it's selling a phone that runs on another operating system. The Priv is an Android phone. Yes, it still has a slide-out keyboard with actual buttons for the CrackBerry addicts. But you can use a touchscreen too. And because it runs on Android, Priv owners will have access to many more apps than they would on a typical BlackBerry phone. 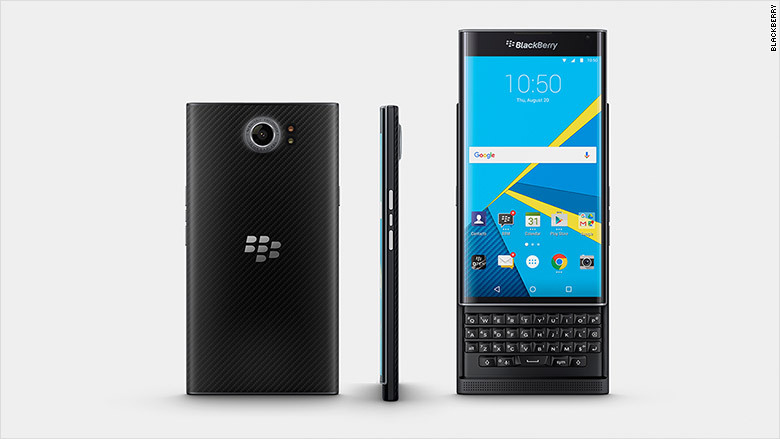 The Priv is -- for now -- only available on AT&T's (T) network in the United States. It's selling for $249.99 with a two-year contract and $699.99 without a contract. It is also available in BlackBerry's home turf of Canada and will soon launch in Hong Kong, the United Kingdom, the Netherlands and Germany as well. Related: Don't ditch that BlackBerry yet! The company said in a statement to CNNMoney Friday that the Priv will eventually be available in other markets too. So can the Priv be BlackBerry's savior? In a blog post Friday, Chen touted the device's security and privacy features, a full-day battery life and the fact that popular apps like Uber, Instagram and Spotify are available ... as well as the company's own BBM messaging service. But reviews have been mixed so far. Engadget said that the Priv is "probably the best-looking BlackBerry device that has ever been made" but added that the $699.99 price tag may scare off a lot of consumers. Wired praised the phone's "awesome" keyboard and said that it's a great phone "if you're a longtime BlackBerry user who's looking for something that finally -- finally -- gives you a hardware keyboard with a legitimate app ecosystem." But the Wired reviewer added that iPhone and Android users (i.e. 96.7% of global smartphone users, according to the latest figures from IDC) would not be impressed with the Priv's camera and touchscreen. Wall Street (and Bay Street in Toronto) didn't seem to mind the reviews though. Shares of BlackBerry gained 5.5% Friday and rose above $8 for the first time since late July. But the Priv must be a massive hit. Otherwise, it may wind up being the last new BlackBerry. The company sold just 800,000 smartphones in its fiscal second quarter, down from 1.3 million in the first quarter. That means BlackBerry has to sell 2.9 million phones in its next two quarters to meet Chen's 5 million sales goal. BlackBerry told CNNMoney Friday that it is still "committed" to its own BlackBerry 10 platform and added that an update "focused on security and privacy enhancements" will be available early next year. But the company would not comment on whether BlackBerry planned to release any new devices that run on BB10 next year. Still, Chen stressed in another blog post last month that BlackBerry is not throwing in the towel on phones just yet. But he reiterated that the hardware unit has to start making money. "Anyone who has been watching closely what I've been trying to do at BlackBerry has surely heard me say that we would not stay in the device business if we were not profitable," he wrote. "That said, we are doing everything possible to make our devices profitable." So what happens to BlackBerry if it does pull the plug on hardware? It would likely continue to support the existing devices out there. Loyalists (I'm talking about you, Kim Kardashian!) shouldn't worry about whether or not their phones will stop working. But the company would likely continue its shift towards selling software that can be used on other smartphones as well as other kinds of connected gadgets -- the so-called Internet of Things. BlackBerry has made three software acquisitions in the past few months, scooping up WatchDox, AtHoc and Good Technology. So BlackBerry's future may not be as bleak as some are predicting. Still, it would be a sad day if the company stopped making its own phones. And unless the Priv flies off the shelves, that day may be coming soon.